With Japan in the midst of a bloody revolution, an elite cadre of samurai swordsmen known as the Shinsengumi must protect the embattled city of Kyoto. Not long ago, young Tetsunosuke Ichimura - page to Vice Commander Hijikata - earned the newest position on this sword-wielding posse. When a strange gun-toting swordsman, Ryoma Sakamoto, recognizes Tetsunosuke and his brother as the sons of someone he calls the "Peacemaker," trouble brews and the other Shinsengumi run the outsider out of town. Meanwhile, Suzu, a rival of Tetsunosuke, involves himself in the murder of a caretaker. 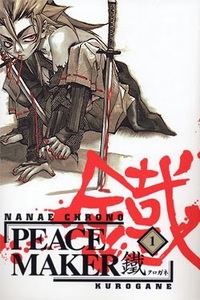 Schemes and battles set themselves in motion, as the lawmen of Kyoto try to keep things in order in Peacemaker Kurogane. Story and art by Nanae Chrono.